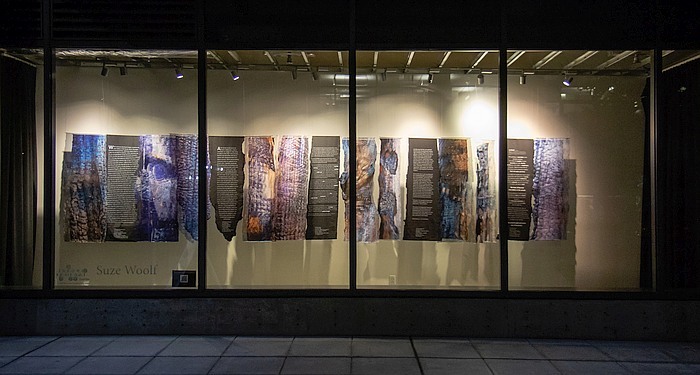 As part of Shunpike's Storefronts initiative, ten of my burned tree paintings have been printed on fabric and installed in Amazon Seattle headquarters' street-level display windows (July-October, 2018). The painting reproductions are in two layers: a solid layer and a transparent silk organza, producing a sense of ghostliness. They are accompanied by five stories written by wildland firefighter and author, Lorena Williams printed on black fabric in the shape of the tree they reference. In 2017, 12 original paintings were installed at the San Juan Islands Museum of Art , mounted on board and suspended from the ceiling. It was an artistic peak moment. A number of the individual paintings are shown the Burnscape section of this site. They were also installed at the Museum of Northwest Art's 2016 Surge Festival and a blog post describes the complex process of production and installation. Please see About the Artist for additional news and current events.